The Baby Shark video produced by Pinkfong has racked up over 2 billion views on YouTube and cracked the Billboard Top 100 – coming in at number 32 on January 7 2019 – so it’s hardly surprising it’s made its mark on many families. 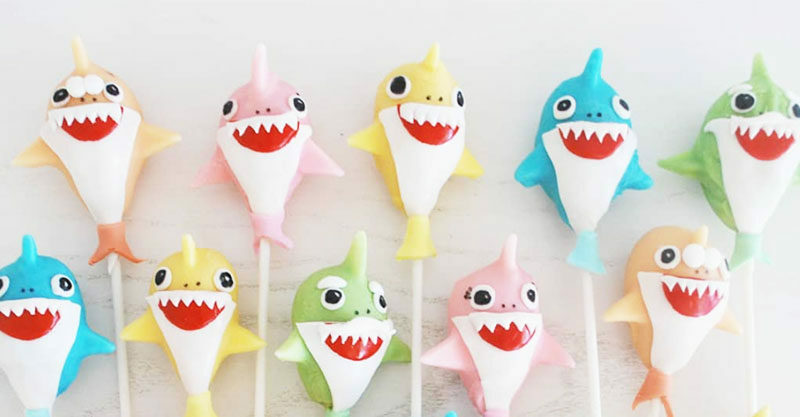 Lots of parents are in fact totally surrendering to the famously repetitive and inexplicably friendly shark, throwing their kids Baby Shark birthday parties and packing their celebrations with toothy treats and decorations. Look at these genius confections? Who wouldn’t want to bite the head of one of ’em?! This is obviously totally next level, but there are also some simpler (aka more achievable at home) cakes tucked away in the #BabySharkParty tag on Instagram. Goodness. How brilliant are these?! While they’re definitely top of the pops in the Baby Shark cookies takes, they also provide some excellent inspiration for a more simplified version – front on simple shark shape with googly eyes, anyone?! Call in the experts if you’re keen to Baby Shark your balloon decorations up. We love these awesomely toothy examples. And bringing lots of shark elements together looks a little something like this. i.e. very, very festive and snappy! These are totally doable for a clever home baker or enlist the professionals to whip some up. Little party guests can whack the heck out of Baby Shark, Daddy Shark and Mummy Shark. Someone was bound to do it after all that ‘Doo Doo Doo-ing’! Oh, how clever are these?! Image all your little party guests with these popped on their noggins! And another look at what going full Baby Shark can look like. This time in a blue colour scheme. Thanks so much for all the brilliant inspiration, Baby Shark party Instagrammers! Are kids’ birthday parties becoming a competitive sport?